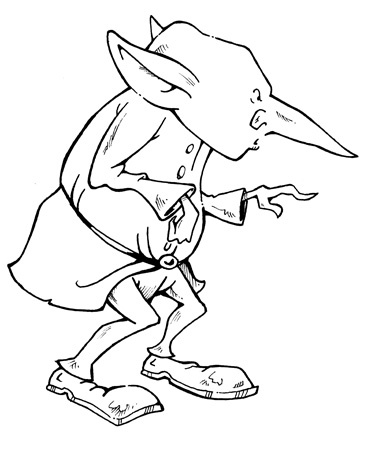 The squat and rather ugly creatures known as gnomes are very similar to dwarves. The main differences are that gnomes don’t have as much hair as dwarves, and they prefer to live above ground. Kendra Kandlestar encountered many gnomes in the small port town Ireshook. Here Kendra and her companions met Squaggle, the first mate on the gnome galley called the Golden Loot, which the young Een girl used for transport to Krake Castle. Kendra found gnomes to be as shifty, messy, and greedy as dwarves, though perhaps not quite as clever.